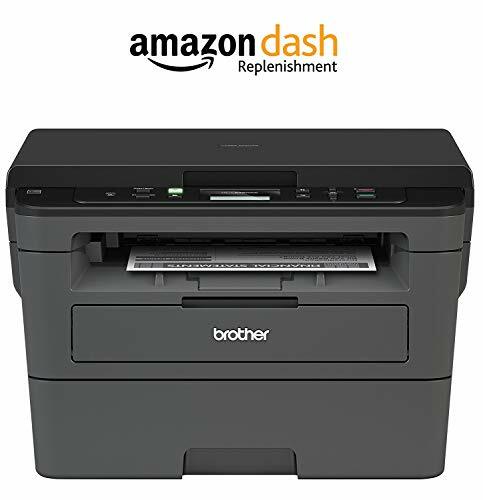 Infused with Brother’s latest technology and designed to enhance office efficiency, the Brother HL-L2390DW is a reliable, robust, and affordable monochrome laser printer with copying and scanning capabilities that is perfect for the home or small office. The modern and updated replacement for the reliable Brother DCPL2520DW is built with a flatbed scan glass that provides convenient copying and scanning. It has also been updated with new features that allow users to scan and print directly from mobile devices, including tablets, and cloud-based accounts. (1) Based on competing in-class monochrome laser printers under 200-dollars. Print speed specifications gathered from manufacturer websites as of 1/9/2017. (2) Requires connection to a wireless network. (3) TN-760 High Yield vs. TN-730 Standard Yield. Up to two times more prints and lower printing costs based on yields and MSRP. Standard Yield and High-yield cartridges sold separately. (4) Approx. toner cartridge yield in accordance with ISO/IEC 19752 (letter/A4). (5) Reprinted from PCMag with permission. Copyright 2017 Ziff Davis, LLC. All Rights Reserved. (6) The mobile device must have NFC capability and run Android OS 4.4 or later.